The term 'WR Sheave Gauges, Ltd.' or 'us' or 'we' refers to the owner of the website whose registered office is 21074 Penny Lane Maple Ridge, BC V2X 8Z2 Canada. The term 'you' refers to the user or viewer of our website. The information contained in this website is for general information purposes only. The information is provided by WR Sheave Gauges, Ltd. and while we endeavour to keep the information up to date and correct, we make no representations or warranties of any kind, express or implied, about the completeness, accuracy, reliability, suitability or availability with respect to the website or the information, products, services, or related graphics contained on the website for any purpose. Any reliance you place on such information is therefore strictly at your own risk. 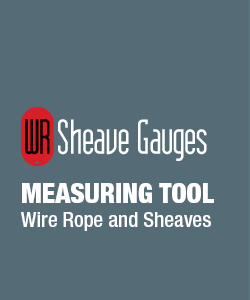 This website and its content is copyright of WR Sheave Gauges, Ltd. - © WR Sheave Gauges, Ltd. 2017. All rights reserved.